Roger took over the reins at Kremlin House Stables in February 2011 on the retirement of his mentor and boss of 10 years, Michael Jarvis. His record following three seasons with a license makes for impressive reading with almost 50 Stakes winners already on the board, including eight at Group 1 level. 2017 sees an exciting new chapter for Roger and his team, as they have purchased Carlburg Stables in Newmarket, the former base of Clive Brittain. Each season has been better than the last for Roger and 2014 saw the team amass over £3million in prize money at home and abroad, including four at Group 1 level. The highlight was undoubtedly Kingston Hill’s St Leger triumph, a first Classic victory for Roger and for jockey Andrea Atzeni. Kingston Hill also finished second in the Derby and fourth in the Prix de l’Arc de Triomphe from the widest of draws. 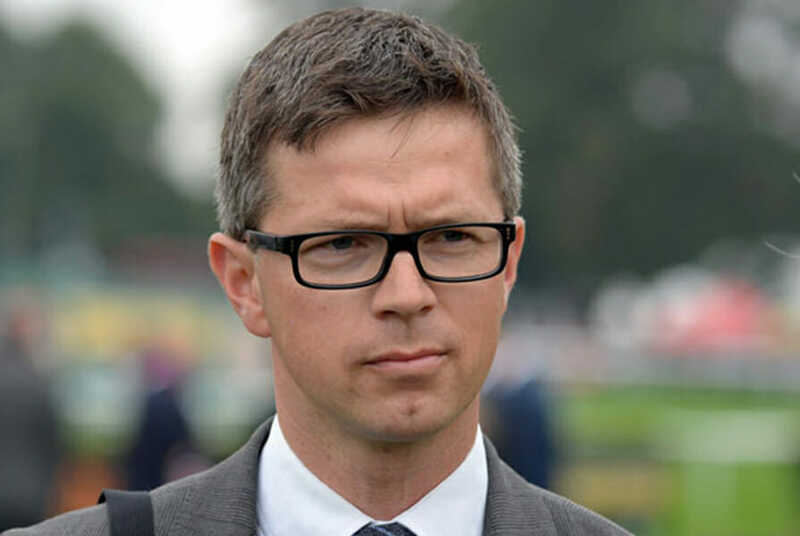 Roger was also responsible for sending out three two-year-old Group 1 winners in Cursory Glance (Moyglare Stud Stakes), Belardo (Dewhurst Stakes) and Vert De Grece (Criterium International) – all three are exciting Classic prospects for 2015. Cursory Glance was also victorious in the Albany Stakes at Royal Ascot whilst talented mare Ambivalent struck in the Group 2 Middleton Stakes at York in addition to finishing third in the Dubai Sheema Classic at Meydan on Dubai World Cup night. Group 1 success has been achieved in each year with Nahrain landing the Flower Bowl at Belmont in 2012, Ambivalent the Irish Pretty Polly in 2013 followed by Kingston Hill’s Racing Post Trophy win in October of the same year. Roger enjoyed watching racing as a child and when he was 13 he began riding out point-to-pointers for Alan and Lawney Hill, who lived locally. During this time Roger got the racing ‘bug’ and set his heart on becoming a National Hunt jockey. He worked for Ian and Tockie McKie before moving to the legendary Josh Gifford’s stable where he rode seven winners as a conditional. Prior to his stint at Gifford’s, Roger spent 10 weeks during the summer working for Michael at Kremlin House and, little did he know at the time that this would be one of the most significant things he would ever do. He then went to America to take up the offer of a three-month placement with Maryland-based jumps trainer Jack Fisher. Six weeks into his stay Roger had a bad fall and smashed his wrist, putting an end to his riding dreams. On hearing about the accident, Michael asked him to become his assistant, and the rest is history..
During his 10 years with Michael, Roger helped oversee the careers of Oaks winner Eswarah, five-time Group 1 scorer Rakti, top sprinter Iffraaj and the globe-trotting Pressing among others.